Keeping your home safe is easier when the environment around it is safe. A neighborhood watch helps look out for signs of trouble, and can prevent break-ins and theft by catching the criminals before they act. Forming a group can be as easy as getting a bunch of neighbors together. 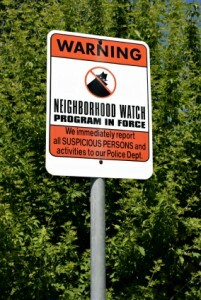 Also, neighborhood and community organizations integrate neighborhood watch programs. Regardless of how the program is set up, it should have certain key objectives to meet the goal of keeping the streets safe. Prevent Crime: Guaranteeing personal security in the neighborhood is accomplished by forming a coalition of people who look out for one another. Together, everyone can watch for suspicious activities and raise awareness on how to prevent and report crimes. Work with Police: Neighborhood watch groups have a distinct advantage when a communication line is set up with the local police department. Reduce Fear: Members of the group can disseminate information about specific risks. Various bits of information can make people in the community feel more secure and develop trust in the program. Starting a watch program means taking initiative. You can engage neighbors and residents in conversation and before you know it, a team of watchdogs is assembled. Set up regular meetings, contact the police department in case they have materials to guide you, and write up a series of tips for distribution to local mailboxes, so everyone can get in on your safety initiatives. A Plan: First, a team needs to get together and plan how the neighborhood watch will operate. This includes assigning roles, getting a map of the community, and assimilating facts on crime in the area. Materials: Items such as communication aids, like fliers, computer equipment for email, etc., brochures, sign-up form, and signs need to be acquired and distributed. Ideas: Committee members should write out what issues are most important, while a location for group meetings should be assigned. In formulating a goal, contacting a police department office helps. They can assign an officer to discuss prevalent local issues and provide some training. A Social Attitude: Since establishing a neighborhood watch means working with people, it is important to have social time. Neighborhood leaders, even elected officials, are sources for support, while local organizations can be your allies too. Local Partnerships: When in charge of security, building a rapport gives you a distinct advantage. Don’t stop with the police or sheriff’s office. Connect with local businesses, media outlets, volunteer centers, and places of worship. All of these tips put together ultimately make your home a safer place to live.